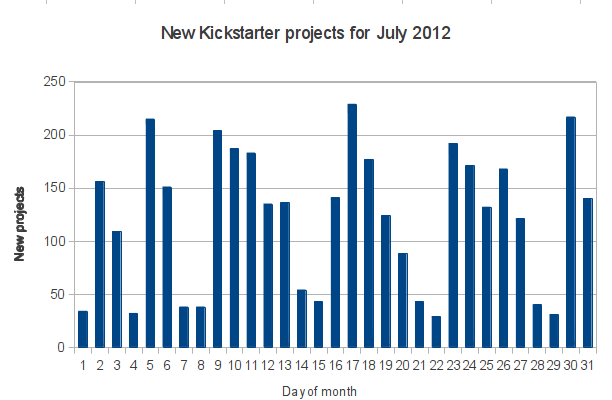 Mon Aug 06 2012 09:47 Zombies of Kickstarter: Many Month of Kickstarter projects are still going on, but since July is over I can present some interesting statistics about the projects that were started during MoK. 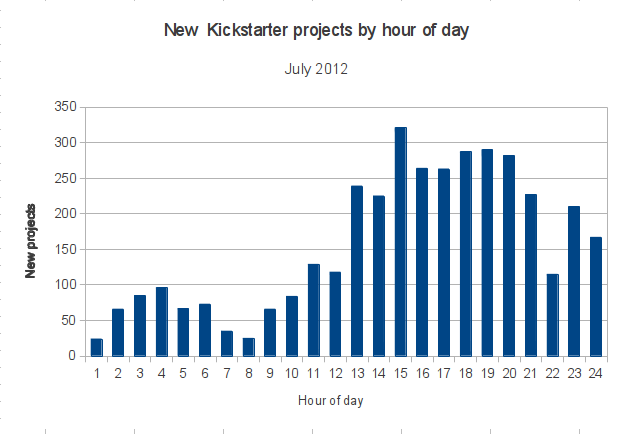 Today I'll share the most basic graphs and take a look at the zombie invasion of Kickstarter. Once your project is submitted to us for a guidelines review, it will take us a day or two to get back to you (longer over the weekends). But, I have a question for people who have started Kickstarter projects: once the project is approved, do you flip the switch to put it live? Or does it go live as soon as it's approved? I can't find the answer in the FAQ, and the answer greatly affects how I should read these graphs. There's a noticeable low-pass filter cutting in at fifteen projects per hour. That's how I discovered I was missing projects. See, my script samples the "new projects" page four times an hour, and that page lists fifteen projects. If more than fifteen projects are approved/go live in a fifteen-minute period, I'll miss some of those projects. I originally thought this wouldn't be a big deal, but it seems to be a medium-sized deal. So, I don't have all the projects, but I do have a representative sample. 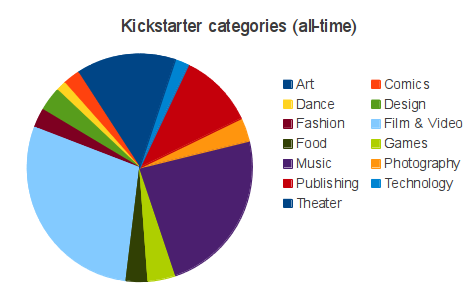 On the left, you'll see the category makeup of all Kickstarter projects, according to Kickstarter's stats page. 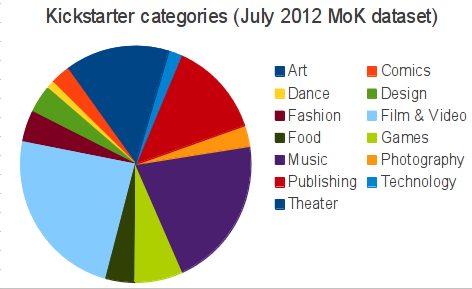 On the right you'll see the category makeup of the projects I gathered during July. They're nearly identical. There's a little less film in my sample, a little more fashion and comics and games. This might be random variation, seasonal variation, or a change in how Kickstarter is used over time. 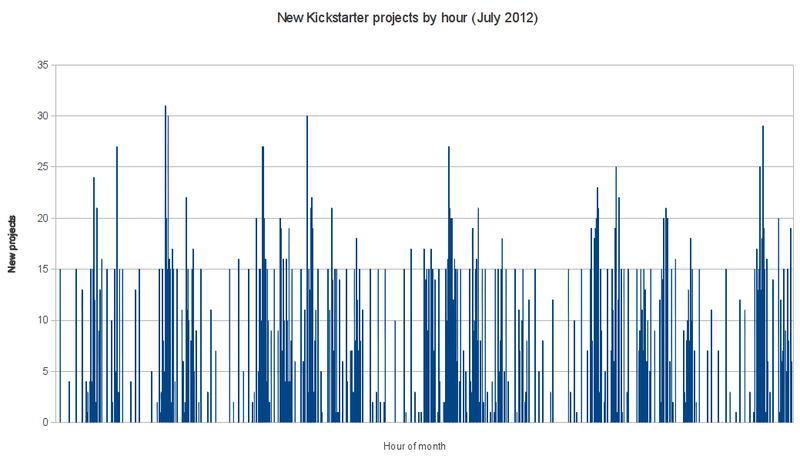 Here's the graph of when Kickstarter projects go live. The X axis is the hour of the day, Eastern time. I think this is just a measurement of when the people who review the projects are at work, but who knows. I think that local maximum at 4 AM is interesting. Now I'm ready to tackle the first real issue: zombie projects. There are so many zombie-themed projects on Kickstarter it makes me sick with a zombification virus. How many zombie projects in the MoK dataset? I'm glad you asked: there are forty-six. 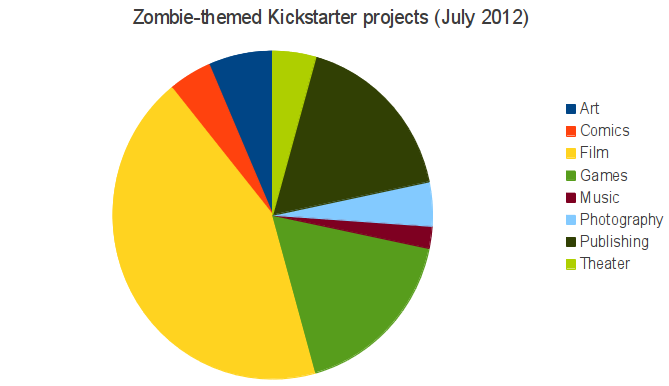 1.2% of all Kickstarter projects are projects about zombies. 1.2% may not seem like a lot, but it means you could do a Month of Kickstarter project and back only zombie-themed projects every day. But no, 1.2% isn't actually a lot. Why does it feel like more? Forty-six projects is a lot by comparison with other nerd button-pushes. July saw only twelve vampire-themed projects, four pirate-themed projects, and ten that mentioned some kind of "alien". There were only fourteen "robot" projects, and three of those were actual robots. I made fun of all the Slender Man projects in July, but there were only four of those. The zombies are disproportionately concentrated in the categories I most pay attention to: books (8 projects), movies (20), and games (8). Music, a huge category I basically ignore because it takes too long to judge the projects, was threatened by only a single hip-hop zombie. 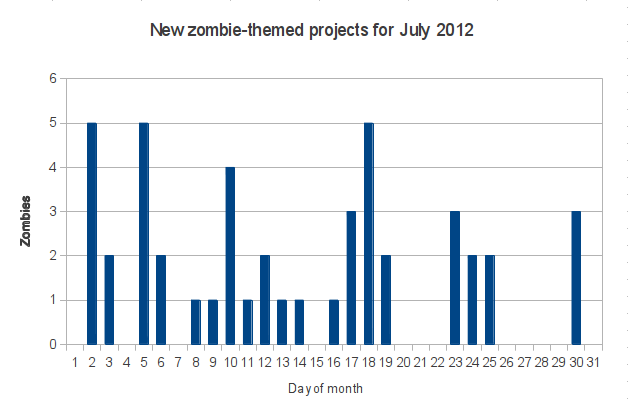 Once July's projects complete I'll be going back through the data and seeing if zombie-themed projects raise more money than comparable non-zombie projects. In the meantime, do you have any similar pet peeves? Let me know. I can determine how prevalent they really are.